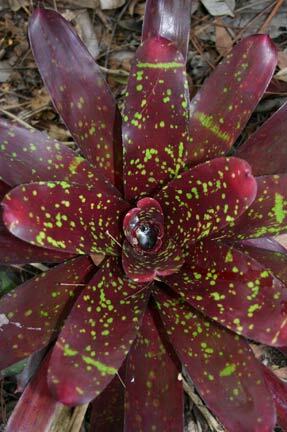 This bright and hardy bromeliad is sure to bring happy thoughts to your garden, with burgundy leaves and greenish gold spots. Grown for its vibrant leaf colour, the flowers are tiny. It will form a bright clump of colour as new pups grow around the edges. Part shade to sun. Plant under trees so the fallen leaves landing in the vase of the bromeliad provide all the necessary nutrients. If in a pot, prefers an orchid potting mix or a porous mixture such as equal parts bark chips, humus, peat moss and sand. During the growing season it is advisable to keep water in the funnel at the centre of the rosette most of the time. Keep the soil barely moist - only water when the soil is dry to the touch. INDOOR PLANTS: Feed in spring/summer by spraying with a weak seaweed emulsion (half the strength recommended on the label). Indoor pests to watch for include scale and thrips (take outdoors for a week, remove by hand). Loss of colour in the leaves may mean either too much direct sun or too cool temperatures.